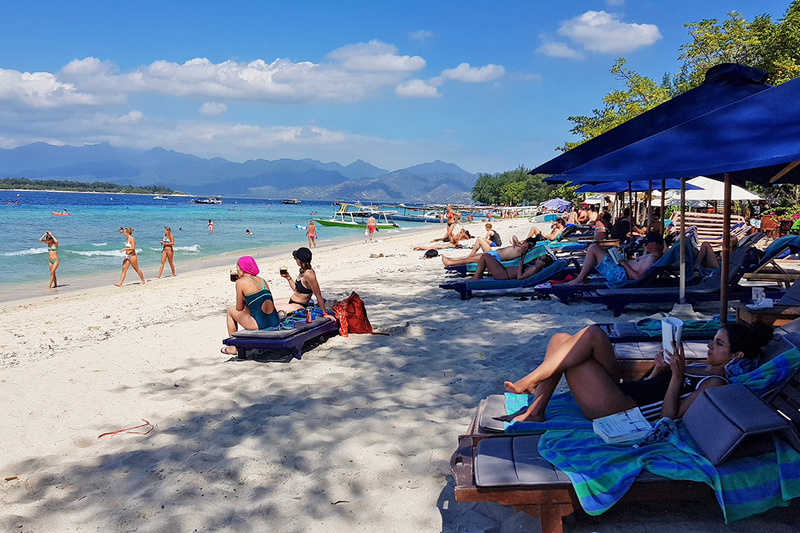 There’s tons of information out there about the Gili Islands, especially Gili Trawangan but sometimes you want a simple read. So, just for you folks that want it laid out plainly, we’re running down our top 8 tips for first timers to Gili Trawangan. Whether you’re coming from Bali or mainland Lombok you will be getting off your boat in the same place at the main harbor area. 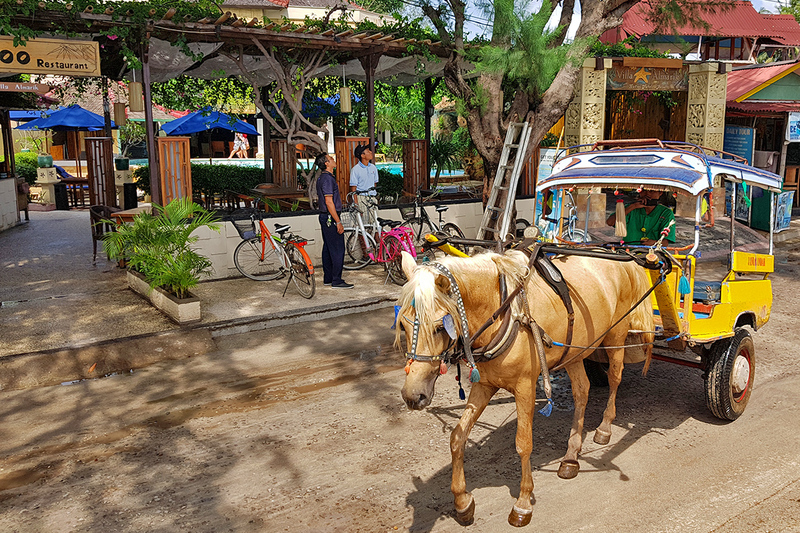 There are no motorized vehicles on Gili Trawangan so to get to Villa Almarik you will need a cidomo or horse and cart. It’s just a short trot down the road to your accommodation. 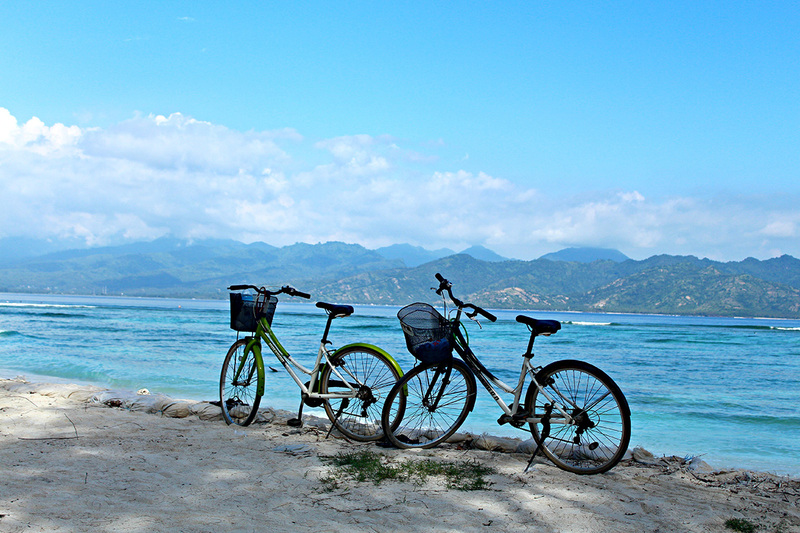 Gili Trawangan is so much more than a bunch of beach bars. It’s a beautiful island with coconut palm groves, quiet beaches, and a lush interior. You can get around on foot or by bicycle and it only takes a couple of hours to tour the whole island. There are 25+ dive sites within 20 minutes of Gili Trawangan so get out there and dive. 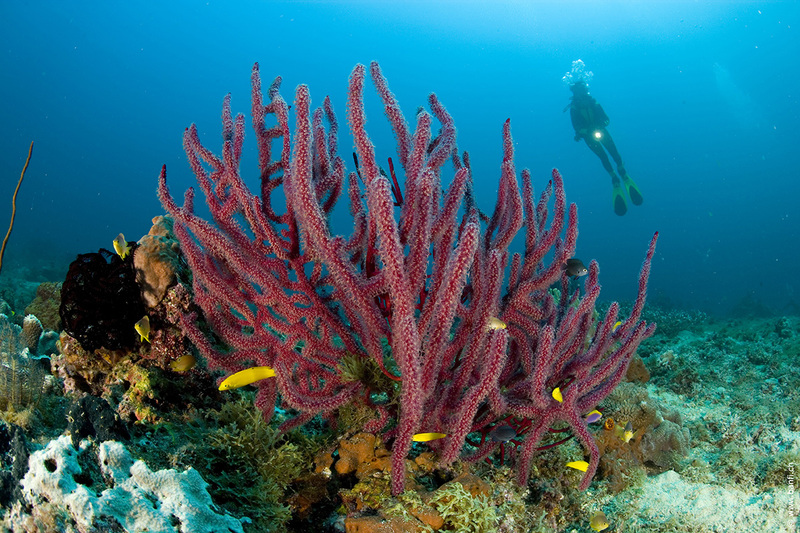 You’re likely to see tons of colourful reef fish, sea turtles, hard and soft coral, and even some beautiful reef sharks. Gangga Divers at Villa Almarik also offers PADI dive courses for everyone from total beginners to specialized courses for experienced divers. 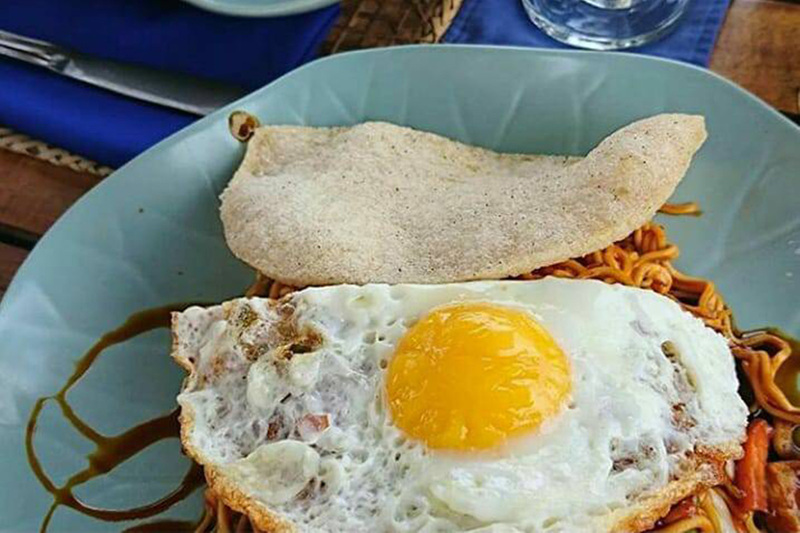 The local cuisine of Lombok, and Indonesia in general, is delicious. The local market is the place to go at night to try some traditional (and not so traditional but tasty) snacks. However, if you prefer to stay in the chefs at Villa Almarik’s restaurant make excellent Indonesian food. Just make sure to mention if you like it spicy or not. This may be a completely moot point because Gili Trawangan is well known for its incredible sunsets. Our tip is to really make time to watch the sunset and take in its beauty. You can watch from the beach or even better trek up Gili Trawangan Hill for the best views over the island and across to Bali. 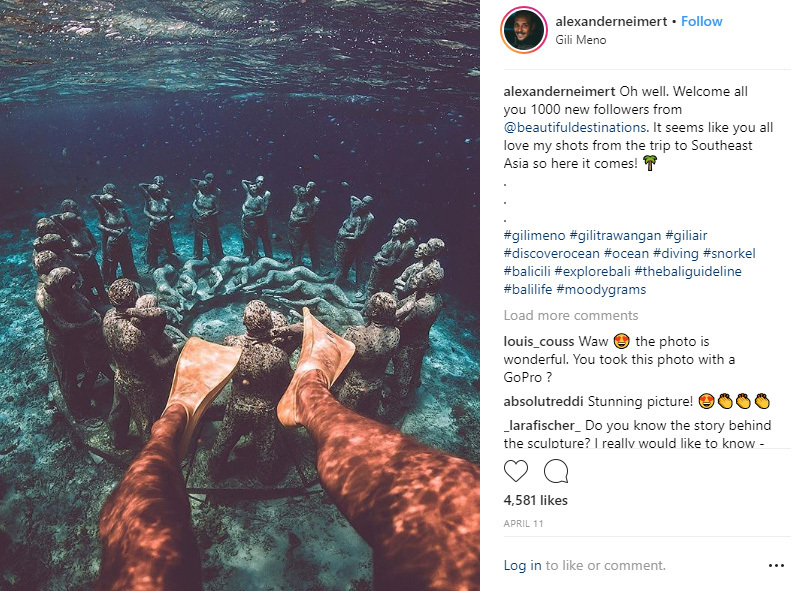 Gili T is one of the best Instagram spots in all of Indonesia. It’s practically begging to be photographed from the tip of every swaying palm tree to the underwater sculptures deep in the sea. Opportunities to wow your followers come at every turn. Villa Almarik has its very own spa where you can really unwind island style. The therapists are trained in techniques from around Indonesia, including Balinese massage and Javanese scrubs and beauty treatments. There is no better place than Gili Trawangan to just relax. There is no pressure to do anything, go anywhere, or be anything in particular. You can just be another tourist enjoying the sound of the sea and the gorgeous sunshine. Take a good book, float in the water, and enjoy a cold beer as the sun sets. You deserve it!